Nike Golf is looking forward to a huge 2013 season. With the signings of Nick Watney and Kyle Stanley and the impending signing of world #1 Rory McIlroy, Nike is making a splash on the PGA Tour. And we cannot forget about Tiger Woods. With these new players, Nike will have a huge face on the PGA Tour. But that won't stop them from releasing new clubs this spring either. Nike has announced some of its 2013 lineup. Nike's new driver release is called the Nike VrS Covert. 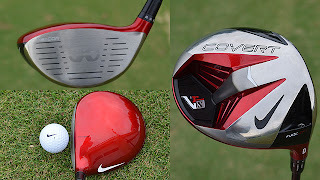 The driver ventures into extreme crown design with a bright red paint job and a large Nike swoosh. The sole design is cutting edge as well, looking more like a fighter jet than a golf club. Nike continues with its adjustable technology, called FlexLoft, that will allow 3.5 degrees of adjustability. Two models of the Covert driver will be available, a Performance model and a Pro model. The Performance model is targeted to the everyday player at 460cc and will come stock with a 50 gram Mitsubishi Kuro Kage shaft. The Pro model will be 430cc, have a more traditional pear shape and will come stock with the real deal Mitsubishi Kuro Kage 60 gram shaft. The Performance model will retail at $299 while the Pro model will retail at $399.